The Atari Video Computer System (VCS) or 2600 was released in 1977 and took the world by storm. It is hard to believe that Atari sold the 2600 in its different forms until 1992. That is a long run! The codename for the system when it was being developed was Stella and that is the name used for an awesome 2600 emulator. If you enjoy the Atari 2600 I highly recommend the Stella Emulator. It is open-source and is available for Linux, Mac, Windows, and others. 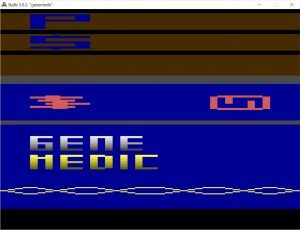 I have never had any problems with it and used it successfully to develop and test my own 2600 game in assembly language before trying it out on original hardware. Download a stable release of Stella here. Stella doesn’t come with any game ROMs. You will need to download those from other sources. Atari Age provides ROMs that you can download. Atarimania is another great source. They even keep a list of the top 25 most downloaded games or you can browse them alphabetically. You should be able to find much of what you want from these two sites. There are others but I don’t recommend them. Be sure and connect your Atari joystick to your PC. It is the only way to interact with an Atari emulator! Have fun!